California is broke. The national debt continues to spiral out of control. 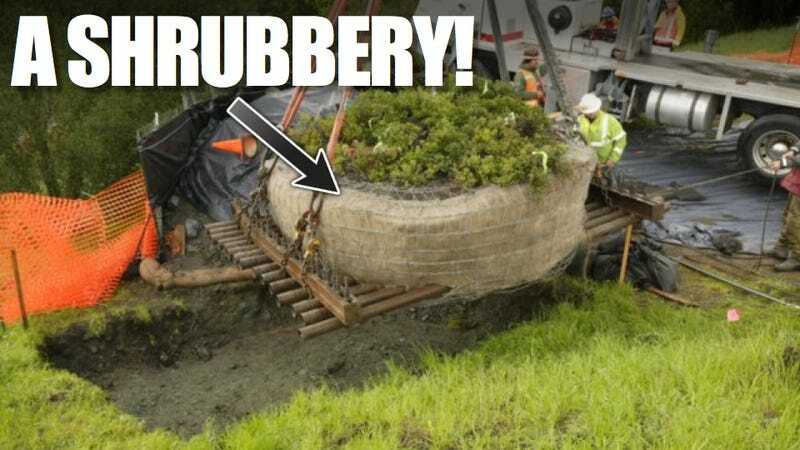 So, it's perhaps a little bit of a surprise that the California Department of Transportation, along with some help from the federal government, spent $205,000 in 2010 to move a shrub that's available at nurseries for about $15. Even the Knights who say Ni would find that too expensive. UPDATE. There's a good chance that the sole remaining in-the-wild Arctostaphylos franciscana would have escaped notice altogether, but for the keen eye of a botanist driving by a soon-to-be-removed median strip near the Golden Gate Bridge. A low, leafy shrub which occasionally sprouts unexciting little flowers, the Franciscan manzanita is that kind of squat ground-cover found all over California. Like other types of chaparral, it's not the sort of thing that draws close attention, but is part of the quilt of dark green sharing the light browns of the state's many hillsides. The Franciscan manzanita didn't excite anyone until the last wild one was found. As it turned out, state and federal funds — some of it stimulus money — paid for the pricey shrub "translocation" project. Moving the plant and the weighty chunk of soil supporting its life cost $100,000, with $79,470 going to "fund the establishment, nurturing and monitoring of the Mother Plant" for a decade, as well as $25,605 to cover what federalese linguists call "reporting requirements." All that added to a road widening project budgeted at more than $1 billion. According to reports, the manzanita is thriving in its new location. You may be asking yourself why the whole thing was necessary. Botanists suggest that putting it in a nursery with a bunch of farm-raised manzanitas would have altered it for the worse. Apparently, San Francisco is a wild place. Who knew? Taxpayers chipped in a lot of money for the security of knowing that the last wild example of the once prolific Franciscan manzanita will survive in its wild new San Franciscan home. UPDATE: It turns out there is a "the rest of the story." After speaking with a handful of conservation botanists (that's what I get for rushing to post before talking to all of my sources), I found out that the Franciscan manzanita Caltrans paid a frontend loader full of money to move is genetically different from the variety found at nurseries for $15 (or, as the San Francisco Chronicle pointed out, as different as German shepherds and wolves). Nursery plants are typically bred to have certain aesthetic characteristics, but are not necessarily suited for life in the wild (and to be fair, in an urban locale like San Francisco, anything that hasn't been paved over suffices for wild, even if it's not as wild as Haight Ashbury at 4 a.m. on a Saturday morning). There are two ways to look at this issue. First, there's the small picture view: $205,000 is a lot to pay to move a shrub no one's ever heard of. As is usually the case, looking at the small picture tends to elicit a knee jerk reaction about the importance of doing whatever just cost taxpayers so much money. Then there's the big picture view: This and other types of chaparral are important to California and should be maintained in a natural state. Why? When native plants and animals disappear, non-native ones take their place. In California's case, non-native plants tend to catch fire more quickly than the native ones do. Remember the fires that caused San Diego County to go off like a tinder pile in the fall of 2007? The California Chaparral Institute told me in 2009 that wispy non-native grasses were the tinder. Non native plant species also affect watersheds, changing the way drinking and floodwater flow, and costing state and local governments a lot of money to get rid of. How much do the state and federal governments spend battling wildfires? According to a recent study, the U.S. Forest Service spent an average of $0.5 billion on emergency fire suppression during the early 1990s. That cost more than doubled over the next decade, and if you've been following the news this year, it shouldn't be a shock that USFS now spends an annual average of $2.9 billion fighting fires. And that's just Forest Service expenditures. State and local fire agencies, the Bureau of Land Management, the National Park Service and even the military chip in resources for fire protection, and it doesn't come cheap. Bearing all that in mind, and the fact that — based upon extensive academic research, mind you — large swaths of non-native plants exacerbate wildfire conditions, it's worth considering the value of protecting biological diversity to make life easier and less expensive for ourselves. In the grand scheme of things, $205,000 is a drop in the bucket, so to speak, even for one plant. It's the last one, and who knows, it could save us money in the future. But they're your tax dollars; you be the judge. Photos used with permission from CalTrans.